Earlier in January, Eric and I attended the media preview of the upcoming 10th Annual Winnipeg Mardi Gras party. The actual event will be held on Friday, February 13th and Saturday, February 14th – Valentine’s Day! The Friday the Thirteenth evening has an interesting twist – the night will feature and explore New Orleans’ voodoo subculture – and as a bonus anyone who presents themselves in full zombie-esque garb will get in free! Valentine’s Night has a bit of different spin – if you are single, you can opt to wear your heart on your sleeve and announce your availability. Who knows what the night will bring! The preview night was a blast and featured the food and drinks for the gala event. We tried quite a few items and were happy with what we tried. 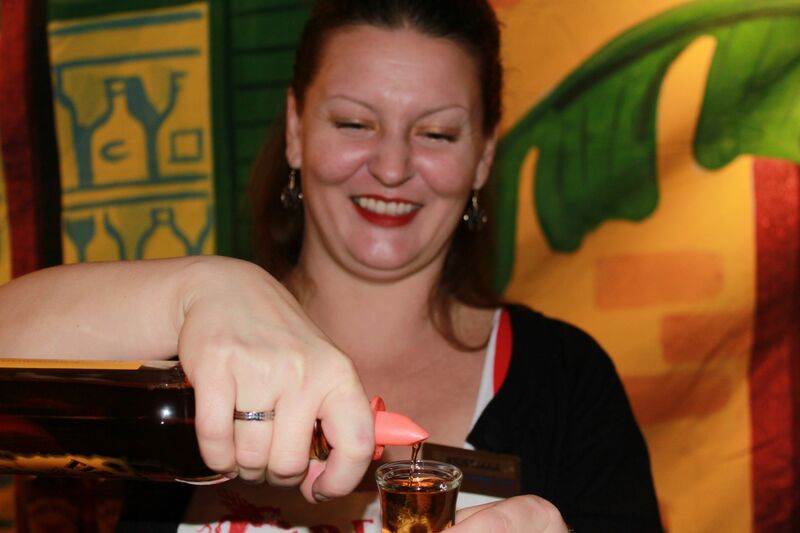 Seeing that it was a chilly January night, We started with Fireball shooters – one was just chilled (icy and spicy all at the same time) and the other was mixed with rum (perfect if you need to cut some of the sweetness of the cinnamon whiskey liqueur). They warmed us up instantly and we were off to try some tasty treats. First stop: Oyster bar! 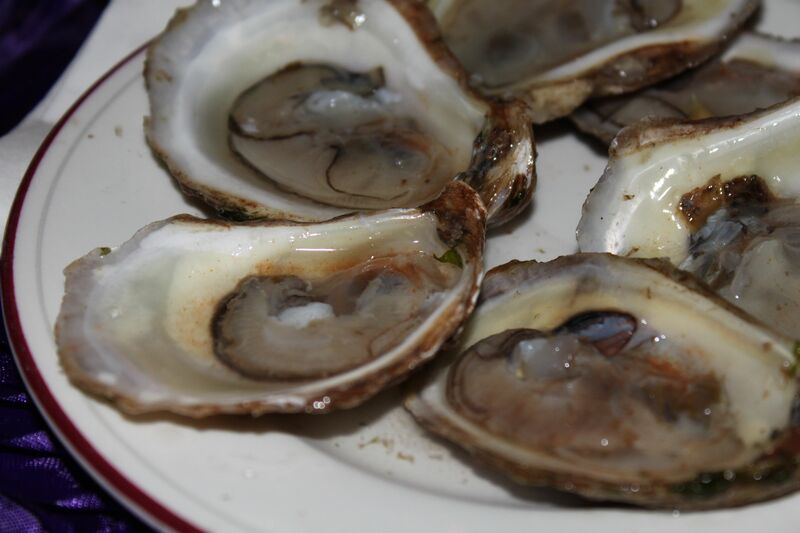 The fresh-shucked PEI oysters were plump, juicy and creamy. A quick dash of Tabasco and small squeeze of lemon complimented the briny oyster liquor. 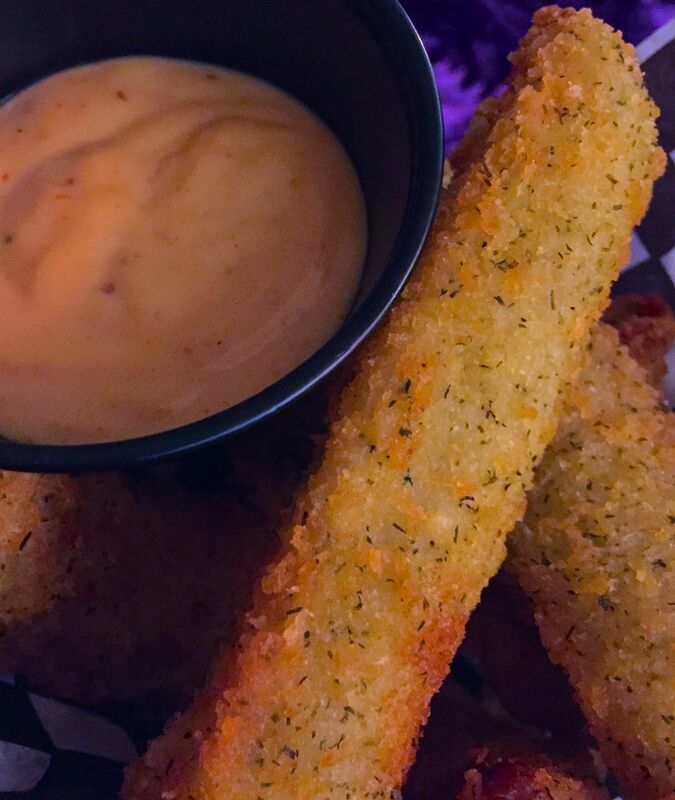 Next on the menu – Deep fried pickles with Cajun dipping sauces served in a miniature deep fryer baskets. 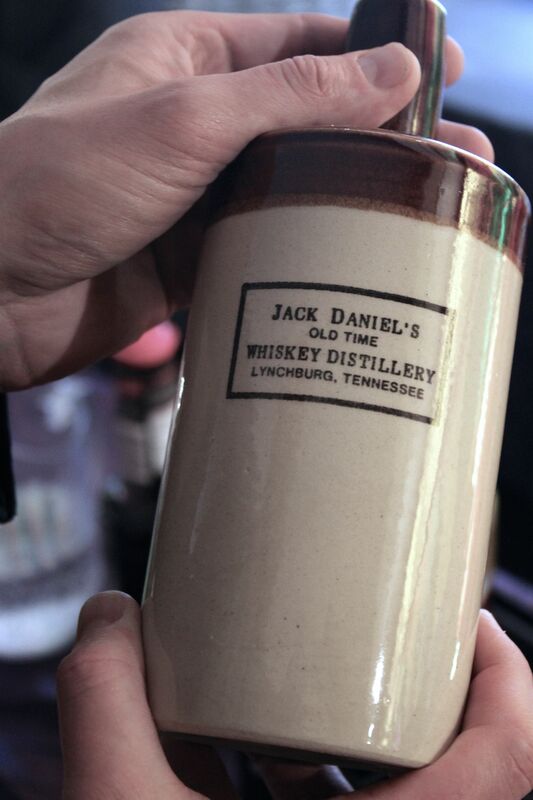 We don’t often see these on menus in our parts – but anytime we travel (particularly in the South) we make sure to order up a batch. Paired with the Cajun dipping sauce, this fried treat had a perfect blend of sour, crunchy, spicy and creamy flavours and textures. Well worth the indulgence. Over at the bar, we found a few more Southern-inspired drink features which included the Oyster Shot – a fabulous pre-mix of ingredients that will curl your Mardi Gras beads. 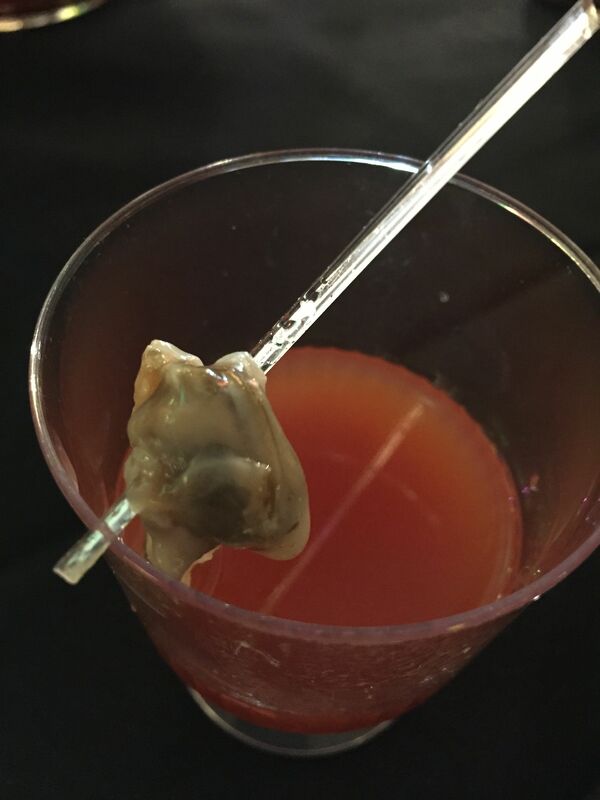 Think of a mix between a Bloody Mary and a Caesar – with a full oyster chaser waiting for you at as you finish the drink. Or if you prefer something a bit headier – Love Potion – gin, lemon juice, grenadine, sparkling Henkell, Trocken Sekt Rosé finished off with a Maraschino cherry. Sweet, bubbly and just fruity enough! Later in the night we stopped by the true Southern cocktail table with bottles of Southern Comfort and Jack Daniel’s. I must confess, I have not been able to stomach Southern Comfort for almost 20 years – in no small part due to an end-of-summer bash when I was tending bar at Rovers Return back in Ontario. Oy! What a night that was! Deciding I must face my demons, I ordered the featured Southern Comfort cocktail which mixed the sweet libation with tonic, lime juice and a lime wedge. Similar to another unexpected hit, white port and tonic, the sweeter SoCo liqueur was well balanced by the bitter tonic and tart lime parts. If you enjoy tonic – then this cocktail will be sure to please! We rounded out a few other food stands before calling it a night: starting with the French Quarter Gumbo with Cajun Crostini – a classic Louisiana soup prepared with Cajun sausage, chicken and okra. True Southern cuisine! I truly appreciate any dish that features okra. It is an oft misunderstood vegetable with an uncanny ability to naturally thickens sauces when sliced and a sticky or slimy substance is released. The Cajun sausage provided just enough heat to offset the rest of the dish. 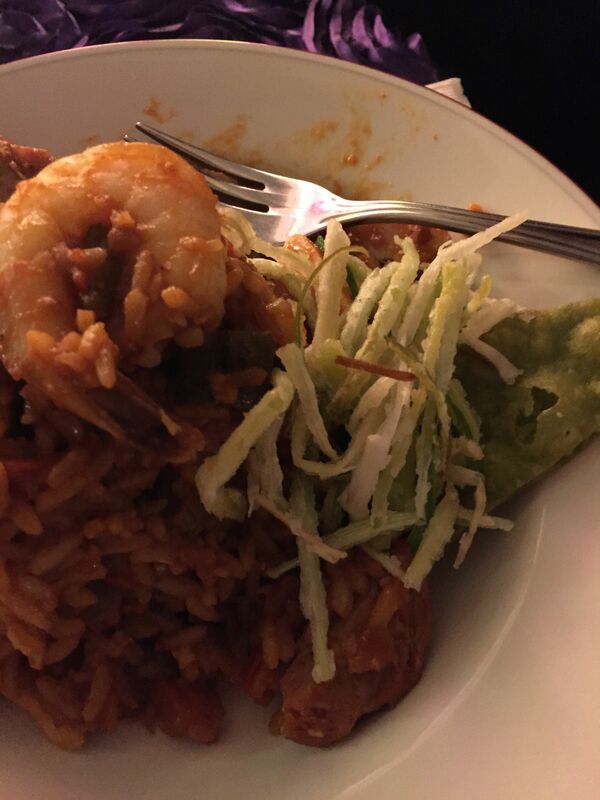 Served with a wedge of lime, it will satisfy those craving a zippy gumbo. 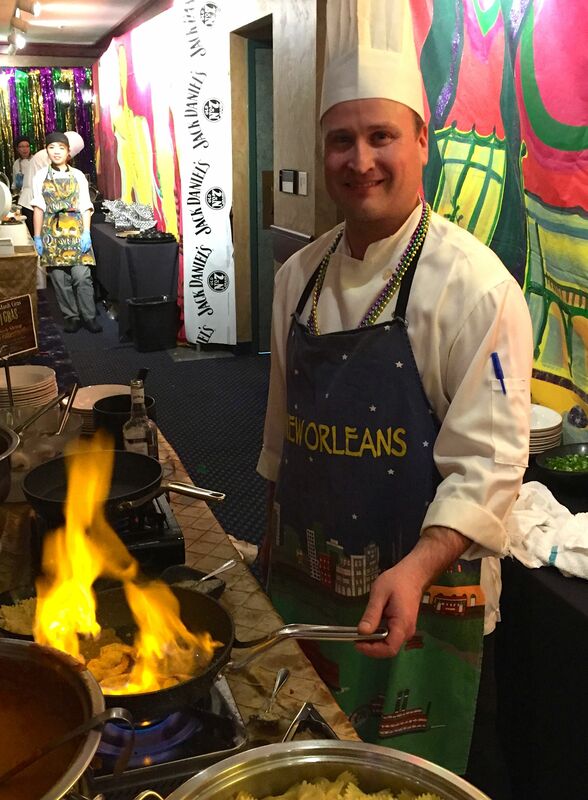 Next up was the Mardi Gras Chicken and Andouille Creole on New Orleans Black Eyed Pea Rice – pan fried chicken and Andouille sausage in a Creole sauce on rice, garnished with chopped chives and a Jalapeño-cheddar and herb baked crostini. Bourbon Street Creole Style Jambalaya with Shrimp, Chorizo and Blackened Chicken – a Mardi Gras classical stew prepared in the traditional manner with tomatoes, okra, bell pepper, onion and rice. Louisiana Style Shrimp with Pasta prepared Étouffée style in a Creole spice blend with onions, garl ic, bell peppers, celery, rich stock, a Gumbo style roux garnished with chopped chives and lemon crisp. 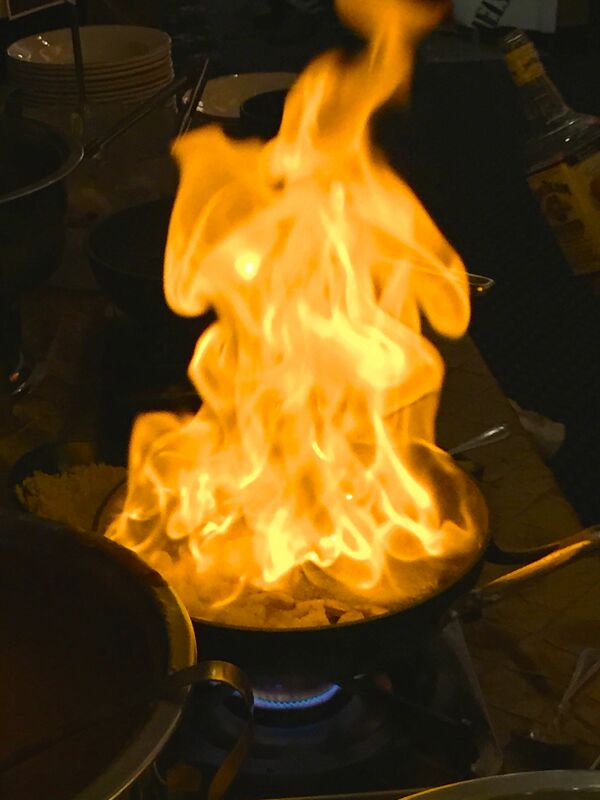 This was a very popular station – first with sautéing fresh garlic then by the flaming shrimp – compliments of good ol’ Jack Daniel’s! There were a few finger food stations as well: Southern sweet potato fries with a zesty Louisiana dipping sauce and the BBQ Pulled Pork Po’ Boy – prepared to order on a French Baguette and garnished with lettuce, tomato, dill pickle and Mardi Gras dressing. Our last indulgence of the night was the Basin Street Pudding with Bourbon laced Caramel Sauce – prepared with raisins and bananas. 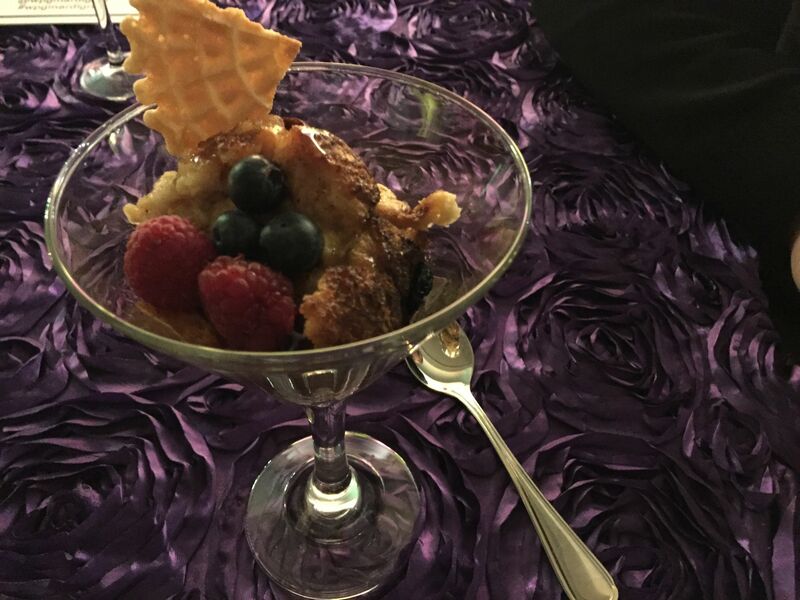 Served warm with fresh berries, the bread pudding sopped up the Caramel sauce while still keeping some crunchy outer crust. An all grown up comfort food! Now for the great part of this post: I have 2 tickets for Friday the 13th Mardi Gras Party to give away to a lucky à la Claude reader. Don’t worry – you needn’t live in Winnipeg to participate in the contest. There’ll be 2 winners – a Winnipegger for the tickets and a special prize for a far away reader. Contest details will be unveiled later this week!